New chapter written in July 2016, replacing one that was written in May 2014 and deleted in January 2015. 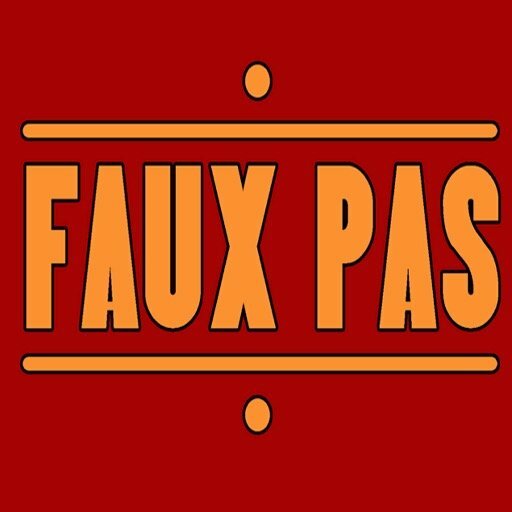 Just like I did for the Rektor in Chapter 13, I have assembled a list of diplomatic gaffs, ethical lapses and strategic errors made by the Deputy Rektor during the course of our brief contact. These errors go on and on and on. Some of them have been covered in previous chapters and some of them are identified here for the first time (based on the existing record published in 2014). I feel it is important to collect them in one place so people who have to deal with Alistair in the future know what to expect. I am providing the list below in roughly chronological order, starting from our cursory contact on January 2014 to our last contact on April 9, 2014. In all, I received five (5) emails from Alistair directly addressed to me. Based on this tiny oeuvre and a few emails from others, I have detected 19 mistakes by Alistair that no one in his position should be making. I have tried to limit this list to mistakes that are clearly documented in the existing record. As long as you believe I have correctly reported Alistair's emails (i.e. that I didn't just make them up), then you have to see that he failed to exercise mature adult judgement in broad spectrum of ways. This isn't just a few isolated misjudgments but a self-reinforcing system of them. There are so many serious errors that your eyes may gloss over trying to absorb them all (as mine did when assembling this list). In that case, you can just read the numbered lines in bold print. Read the regular text if you want to see my documentation and explanation for each. I suspect other errors by the Deputy Rektor, but I am only listing those I can clearly substantiate. Why does any of this matter? Because Alistair's behavior in this one case is bound to be reflective of his behavior over time in countless other unrelated cases. This is an issue for everyone at the school. 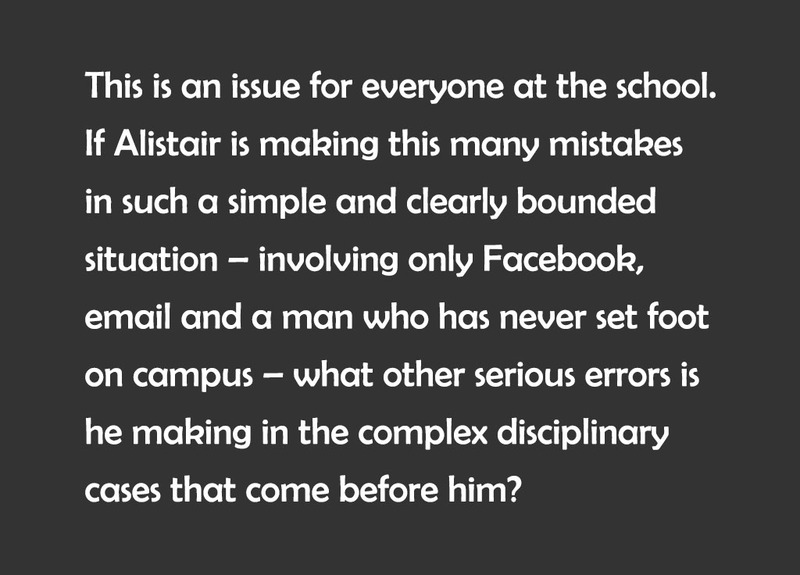 If Alistair is making this many mistakes in such a simple and clearly bounded situation—involving only Facebook, email and a man who has never set foot on campus—what other serious errors is he making in the complex disciplinary cases that come before him? The first three errors come from brief emails on Jan. 3 and 5, as chronicled in Chapter 5. 1) The Deputy Rektor failed to read my speaking proposal before questioning my student sponsor about it. In a Jan. 3 email directed to my student sponsor (not me), Alistair expressed concern about how much funding would be required. If he had read my proposal, he would have seen "at my own expense" on the second page and wouldn't be asking my student sponsor about it. This mistake is excusable since all administrators are busy and can't read everything that crosses their desk. It also could be seen as my own fault for not putting "at my own expense" in bold print on the first page of my proposal so it could be clearly seen. Still, the failure to read the proposal before responding to it was Alistair's error, no one else's. 2) When the Deputy Rektor's Mistake #1 was pointed out to him, he tried to blame my student sponsor for it. My email on Jan. 5 said: "I would require zero funding. (That's $0 or �0 or NOK 0.)" Alistair replied: "I became involved purely as [Hero] requested extra-ordinary travel funds in a message to me." I believe this statement was false, because Hero's message to the administration made no request for extraordinary travel funds. In theory, Hero could have sent another message I'm not aware of asking for funding, but this didn't make sense either because it was always clear between the two of us that I would pay my own way. The most Hero might have asked for was the same thing I asked for in the email Alistair was responding to: one night's lodging on or near campus. The main effect of Alistair's statement above is that it shifted blame for his not reading the proposal onto someone else, a much weaker party who couldn't fight back. Four parties were CC'ed in both my "zero funding" reply and in Alistair's response, so I think he was trying to save face with the others by saying that Hero had requested funding, but I believe that no such message came from Hero. 3) As an official representative of the school receiving a direct email from someone offering to speak, the Deputy Rektor missed an opportunity to welcome me to the school and give me a roadmap for what would happen next. In other words, he is saying, "If there's no funding involved, it's not my problem." It is true he included a perfunctory, "Thankyou for your offer," but there is so much more he could said, given he was the first official at the school to communicate with me. If you were him, wouldn't you have said more? For example, he could have explained what the World Today Committee was and who was in charge of it. He could have laid out the school's procedures for reviewing speakers. He might have given me a timeline for the school's reply. He could have actually read my proposal and given me a preliminary assessment of it. Alistair did none of this. 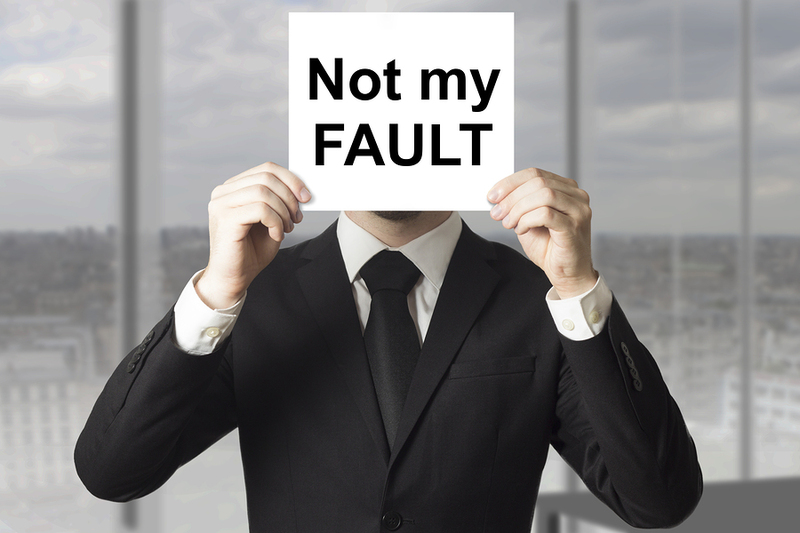 He simply said "It's not my problem," and bowed out. Because Alistair didn't identify himself in the email, I assumed at the time that he was just someone in the Accounting Department of the school. I didn't suspect he was second-in-command because he wasn't acting like one. He was responding as you would expect an accountant to: "If there's no money involved, it's not my problem." 4) When Abigail's complaint surfaced, the Deputy Rektor, like the Rektor, chose to grill my student sponsor and force him to defend me instead of contacting me directly. This is the same mistake I pointed out for the Rektor (his Mistake #3). For a week starting around April 3, the two of them put my student sponsor through the ringer. In a series of tense meetings, they placed Hero in the impossible situation of being forced to defend me while forbidding him to talk to me about what was going on. I knew Hero was under a lot of stress, but he couldn't tell me what it was about until after Alistair sent his Welcome email a week later. I don't know which of the two administrators chose this course of action, but the other implicitly endorsed it. Neither of them seemed to have the courage or initiative contact me directly. Instead they tormented a innocent student who wasn't responsible for my actions and who shouldn't have been required to defend me. 5) Alistair failed to identify his position in the organization, so I had no idea who I was dealing with. He signed his email only "Alistair", as if everyone in the world already knew who he was. He gave me no direct indication that he was Deputy Rektor or that he had any official standing in the organization. I learned his job title only from the school's Annual Report after my lecture had already been cancelled. Without knowing his position in the organization, it was hard for me as an outsider to know how to respond. I responded as though he was someone high in management, but that was only a guess on my part. 6) Alistair gave me a seemingly impossible request�for a "reference/recommendation"�without explaining what it was or how I was supposed to obtain it in the few hours before my lecture. For someone outside academia, this is like asking for a "Form 74376/AB" without any further explanation of what this form is or where one can obtain it. I still have no idea what a "reference/recommendation" should look like, who it should be from or how I would obtain it within a few hours. There are two ways to interpret Alistair's reference/recommendation request: naive or malicious. The naive explanation is that Alistair had no idea how the world works beyond campus and couldn't conceive of how I might be confused by his request. The malicious explanation is that he was deliberately giving me a request he knew I couldn't fulfill as an excuse for cancelling my lecture. 7) In this first official correspondence with me, knowing almost nothing about me, Alistair inappropriately revealed sensitive information about a student. In the interests of openness, I'm afraid I must comment that one of our students who you met this winter in Copenhagen expressed some concern to the Rektor that you would be visiting RCN this w/end. In confidence, she felt uncomfortable with some of your interactions with her on social media. I contend that this kind of sensitive information should not have been revealed in an email and certainly not in the first communication you have with someone, before you know anything about them. There are things you should use email for and things you shouldn't. It is entirely appropriate for an administrator to send me an email welcoming me to the school and asking about my plans. It is entirely inappropriate to reveal in that first blind email that a complaint has been made against me. Let's imagine that I was indeed sexually harassing this student, sending her lewd and inappropriate messages in spite of her genuine efforts to end the contact. By immediately revealing this complaint, Alistair has instantly made this student vulnerable. If I am the bad person they think I am, then there is no telling what I might do in response. Remember that Alistair has no idea who I am at this point. He has had no opportunity to gauge my personality and see if I actually am a threat, yet he has no hesitation about revealing the fact of the complaint before we have even said Hello. Email is an excellent way to make initial contact, but it is not the place to negotiate something sensitive. As soon as you reveal something in an email, you lose control of it. You can't finesse your responses in real time. You're only lobbing a missile into unknown territory and seeing what the reaction is minutes or hours later. In this case, there could have been a big blowback against the student. If I were the inappropriate communicator they assumed I was, I might have contacted the student in anger and demanded an explanation, and suddenly her discomfort gets even worse. That a student was uncomfortable was a fact I don't dispute, but there was a whole spectrum of ways the administration could have handled her concern, ranging from confronting the accused, to counseling the student, to doing nothing and just letting the visitor come and go from campus. By fixing the complaint in an email to a stranger, Alistair was committing his organization to the confrontation approach. In strategic military terms imagine it like this: You have an opponent you know nothing about. He lives in a black box. You don't know who he is, what his intentions are or what weapons he might have at his disposal. In your very first communication with him, you don't want to provoke him with a direct challenge that forces him to respond, because you have no idea what will happen. 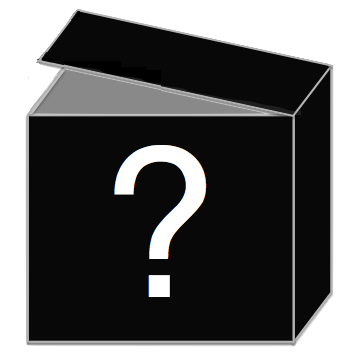 First you want to find out what's inside the black box. If any discussion with me of Abigail's complaint were required, telephone would have been a much better medium. On the telephone, a skilled diplomat could have asked me questions and felt me out before revealing any sensitive information. While I was still in the USA, telephone would have been easy. In my home country, receiving a call from Norway would have cost me nothing. It could have happened in my layover at JFK airport on the way to Europe, but Alistair didn't offer me this option. He didn't give me his phone number or ask for mine. He confronted me by email, so I had to respond by email. If Alistair's intention was to protect the student, his indiscretion did the exact opposite, making her far more vulnerable. Of all the student victims of this tragic affair, I think Abigail was the most abused. She was betrayed mainly by the administrators she sought help from. Her complaint may have been naive, but I think her anxiety about my presence was real. When she revealed her discomfort to administrators and they mishandled it, they must have made her anxiety a hundred times worse. Although I have had no contact with her since the Monday Night Massacre, I'm sure she knows that her actions caused a campus crisis and the cancellation of my lecture. I think she will be scarred for life by the incident. All teenagers make mistakes. It is the duty of responsible adults to soften the blow of those mistakes and provide at least some protection. The Rektor and Deputy Rektor, however, threw gasoline on her mistakes, turning Abigail's private discomfort into a massive public explosion. I reacted the only way I felt I could at the time: I was confronted with an accusation and defended myself. I deeply regret that Abigail was hurt in the process. There are many things I have done in this Tiny Little War that I now realize I should have done differently, possibly softening the blow on Abigail and the other students, but the fact remains that Alistair placed me in this position: obtusely confronting me with a charge that I was forced to respond to. 8) Alistair wrongly expected confidentiality from me without first gaining my consent. In confidence, she felt uncomfortable with some of your interactions with her on social media. Child #1: "I've got a secret, but you have to promise not to tell." Child #2: "Okay, I promise." Child #1: "So here's the secret...."
In other words, if you expect someone to keep your secret, you first have to get their consent before you reveal it. Keeping secrets requires energy, resources and an element of anxiety. Secrecy is a burden, so you don't expect it from a stranger. You expect it only from someone you have established a relationship with, who has entered into a voluntary contract with you to keep the secret. You don't walk up to a stranger in the street and say, "I just robbed a bank, but don't tell anybody," because you have no contract with them. That person is still going to report you to the police even though you said, "Don't tell anybody." Likewise, when Alistair inserts "In confidence" into his first email to a stranger, he is in no way obligating that stranger to respect the request. Given that Alistair is making allegations about me, my first priority is to defend myself. Any requests for confidentiality are low on my list. To paraphrase Alistair's email, he is saying, "We don't trust you, and we want you to verify your worthiness to speak at our school, but we're still giving you sensitive information and expect you to keep it confidential." 9) Alistair implied, without evidence, that I had acted improperly toward a student. In that second paragraph, it seemed like I have already been tried and convicted of doing something improper, even before Alistair has communicated with me. That a student was uncomfortable is a fact. Everyone has the right to feel uncomfortable about anything, but there are a lot of reasons one could feel uncomfortable, many of which involve no wrongdoing. The fact of someone's discomfort does not prove in itself that something improper has taken place; yet here you have the Chief Justice of the school's disciplinary system declaring in only thinly veiled terms that I have somehow violated the "sensitivities" of adult-student interactions. The first paragraph is mostly a statement of fact: A student was uncomfortable and spoke to the Rektor about it. The second paragraph is a judgmental statement of Alistair's personal belief not supported by any facts. I know there are no facts to support this belief, because I am the only person with a complete record of all my interactions with all the students, and there's nothing there that could be regarded as improper by any intelligent person. Alistair has far less data than I do; yet based on the student's discomfort alone, with no response from me, he had jumped to the conclusion of my guilt. Keep in mind the Deputy Rektor is the chief disciplinary officer of the campus, effectively serving as judge and jury for all manner of alleged student wrongdoing. If he has already convicted me based on one student's discomfort without asking for my side of the story, what is he doing to students? If a student is accused of violating the school rules but feels they are innocent, what chance do they possibly have of defending themselves? 10) Alistair unnecessarily insulted me in his opening communication with me. As mentioned in the previous error, he is jumping to conclusions without evidence, but he is also unnecessarily insulting me by announcing his conclusions in his first communication with me. There is no way that anyone could take the quote above as anything but an accusation. This a totally improper way to open a conversation with stranger because he has instantly put me on the defensive and lost my trust. 11) Alistair made some highly charged allegations about me but did not ask for my side of the story. In fact, he hardly asked me any questions at all. Alistair asks me no questions because he apparently believes he already knows everything important about me. He knows my background. He knows my intentions. He knows that my interactions with Abigail were improper. He seems to fully understand who I am without any prior communication with me (apart from that brief email exchange in January he probably didn't remember). The only thing he doesn't know is my travel plans. And this is the guy handling sensitive student matters! In every case that comes before him, he already knows everything, so he doesn't have to ask questions. 12) Alistair cited a "Rektor's Policy" that I believe never existed until Alistair invented it. I appreciate this is late in the day, but the Rektor usually requires me to request a reference / recommendation for a guest speaker coming for the first time to our College." The word "usually" implies the Rektor has a longstanding policy in this regard, but I am skeptical that any such policy has ever existed. I doubt that any first-time speaker at Red Cross Nordic has ever been asked for a "reference/recommendation" at any time in the school's history, let alone a few hours before their speaking engagement. I think Alistair made up this policy just for me and without the knowledge of the Rektor (who wasn't CC'ed). 13) Alistair's Welcome email cites other parties—the Rektor, Dr. Pederson and "four members of our Education Management Team"—but he fails to CC any of them in the email. Although Alistair is citing the Rektor as his authority for making the reference/recommendation request, he is not CC'ing him, so the Rektor has no opportunity to confirm or deny that this is his policy. Likewise, he is mentioning Dr. Pederson as the person in charge of the speaking program but he doesn't CC him. He consulted "four members of our Education Management Team this afternoon - including the Senior House Mentor responsible for student welfare - and they asked me to pass on this concern directly to you," but he didn't CC any of them either. Kind of weird don't you think? In academic institutions, everyone is always CC'ing everyone else, especially when other parties are implicated in the email, but this critical email is strangely "naked" with no CC's to anyone. The absence of CC's may seem like a minor breach of protocol, but it had significant repercussions later. It meant that the Rektor may not have had access to our most critical correspondence at the time he issued the ultimatum that launched us into war. If he had been CC'ed in Alistair's original email, then I would have included the same CC's in my response, and the Rektor would have seen what I actually wrote, not just what Alistair reported. Without the CC's, the Rektor was blind and apparently had to rely on Alistair's verbal account of our correspondence. Judging from the Rektor's Ultimatum email, Alistair conveyed to the Rektor that I was being uncooperative, a conclusion the Rektor probably would not have made had he read my emails himself. As with other mistakes by Alistair, you can read his actions as either naive or malicious. The naive explanation is that Alistair simply forgot to CC anyone else in the email. This is hard to believe given that the administration had already been through a week of high tension regarding my coming visit and this email was the school's first official external response. The malicious explanation is that Alistair deliberately declined to include any other CC's so he alone could control our communication and interpret it to the others. If the Rektor wasn't CC'ed, Alistair could invent any Rektor's policy he wanted without the Rektor himself interfering. He could also report our exchange to the Rektor in any manner that suited him without the Rektor seeing the evidence and make his own interpretations. A third possibility is that Alistair BCC'd the others (invisible to me). That option, too, could be seen as Machiavellian, because it would have deprived the Rektor of the opportunity to read my direct replies. The Rektor would have seen Alistair's request but not my response to it. So that's nine (9) major diplomatic, ethical and tactical errors in a single email. Now we move on to the later emails, when Alistair responded to my responses. The errors keep piling up! 14) Alistair failed to acknowledge my defense to the main charge against me—that I had made a student uncomfortable on social media—and there is no indication that he passed my defense to the Rektor or the rest of the staff. I responded immediately and directly to this allegation in a carefully composed email sent only to him (since he provided no CC's). The gist of my defense: If a student is uncomfortable with my contact on Facebook (the only social media we were using), why haven't they unfriended me? Alistair did not acknowledge my response in any way. It was as though I never wrote it. And since no one else was CC'ed, no one else at the school was allowed to read my response. It was effectively buried, and Alistair could report it to the rest of the staff—or not report it—however he chose. 15) When I pointed out that no one on the school's staff had ever contacted me about my speaking engagement, Alistair missed an opportunity to acknowledge this oversight and apologize on behalf of the school. This would have been a perfect opportunity for Alistair to acknowledge that my concern was warranted and apologize on behalf of the school. Apologies are cheap. He could have said, "Oh, I wasn't aware of that. I apologize if no one contacted you. I'll try to find out what happened." Alistair made no such apology. He didn't acknowledge my concern at all. His unspoken statement, as I received it, was, "This is normal for our school. We have no obligation to contact you. We are letting you speak as a courtesy to you and your student sponsor. We have already arranged things through your student sponsor. We are under no obligation going to address you directly or accommodate you in any way." If course, he didn't say that, but that's what his silence implied. 16) When I asked what a "reference/recommendation" was, Alistair never replied. Just before boarding my flight from New York to London, I wrote an email asking what a "reference/recommendation" was and how I was supposed to obtain it as I was heading for Norway. Although I privately thought the request was insane, I replied diplomatically and raised some reasonable questions, but Alistair sidestepped them all by saying, "The reference request was late, I understand." There was no clarification, no admission of error and no acknowledgement that the request might had been confusing to others. Frankly, I couldn't have complied with the request even if it were made back in January. I believe the request was both meaningless and inappropriate and never would have been made of any other speaker. When the absurdity of the request became clear, Alistair admitted no fault. He only backed away and changed the subject. Imagine that a student is called before Alistair on some disciplinary matter, and Alistair makes a similarly absurd and impossible request. What do you suppose will happen if that student tries to raise a rational objection? Is that objection ever going to be heard? If his own thinking is flawed, as it was here, is Alistair ever going to admit he was wrong? 17) Alistair offered to help me find accommodation near the campus but not to pay for it. Please let me know if we can help with accommodation while you're here for Friday night (I assume). Given our rural somewhat remote situation, accommodation is limited but there are rooms available in "Riggen" for 250 NoK / night, that could be reserved? It turns out I was self-sufficient. I had a rental car and a sleeping bag and was perfectly comfortable sleeping in the back seat of a car. I didn't need accommodation, but I still found Alistair's offer deeply offensive. I had come to Norway at my own expense, rented a car at my own expense and set two days off from my schedule for this speaking engagement. I was also spending a fair amount of time and mental energy preparing for my talk. One night's lodging did not seem too much to ask for the free service I was providing to the school. Alistair's diplomatic blunder was that by advising me about lodging, he was rubbing it in that the school wasn't going to pay. The unspoken message was, "We will tolerated you here, but we are not going to raise a finger to accommodate you." I never told Alistair my lodging plans because unless he was going to pay for it, it was none of his business. A wise diplomat would have never brought up the matter of lodging so as to not raise the awkward question of why the school wasn't providing it. BTW: 250 NOK is the equivalent of US$30. 18) Alistair reversed the school's own request about when I should come to campus. My original plan was to come to campus on Friday afternoon, speak on Friday evening, then leave on Saturday. This changed when Hero told me that I needed to be on campus on Thursday to meet the staff. This was presumably at the request of Dr. Pederson. As with all of my dealing with the school prior to Alistair's Welcome message, no staff member ever contacted me directly. Instead, all messages (including my "invitation") were passed to me through my student sponsor. We normally ask that visitors be on campus over the w/end, to minimise disruption to the weekly programmes. This was too much to take. I had successfully outmaneuvered Alistair's "reference/recommendation" request, but now he invented a new barrier to throw in my path. This is the point where I decided to stand and fight. The original plan was to meet the staff on Thursday, so that is what I intended to do. I composed a new email stating my position, knowing full well that it would be intolerable to Alistair and would trigger a crisis. I think it is VERY IMPORTANT that we meet on Thursday. I would only come to campus to talk to you and the relevant staff (and hopefully to [Hero]). I can remain off-campus otherwise. The only reason I had scheduled my arrival for Thursday is because [Hero] thought this would be a good time to talk to the staff. If you are telling me now that no meeting can happen on Thursday, then we have another disconnect. If I cannot meet with you, then at least let me meet with Dr. Pedersen or someone else on the World Today staff so we can discuss my presentation. As I expected, this demand destabilized Alistair and really made him crazy. His response proceeded in two opposite directions at the same time: He desperately tried to negotiate with me while at the same time manipulating the Rektor against me. Remember that the Rektor wasn't CC'ed in the emails between Alistair and me, so Alistair could report my behavior to the Rektor any way he wanted. 19) Alistair appears to have misrepresented to the Rektor the content of my email communication and withheld key information from him. Most of my email communication with Alistair had no CC's. (Where there was a CC, the other party was the head of the speaking program, Dr. Pederson, who took no public action at any time during this affair.) The Rektor was not a party to these emails until I added his address in my holding-the-line email on April 9. Instead of reading what I actually wrote to Alistair, I think the Rektor received a verbal report from him, which was colored by Alistair's emotional self-interest. In one important email not CC'ed to the Rektor, I offered Alistair a compromise, saying I could meet a staff member in the nearby town of Flekke instead of the campus. I am coming to Flekke tomorrow [Thursday]. If the staff is uncomfortable with meeting me on the campus we could meet in Flekke itself. I will not come onto campus unless I have permission. I thought this was a reasonable compromise. If they didn't want me disrupting their campus programs on Thursday, then we could meet off campus, where I had every right to be. As far as I know, the Rektor never received this offer, since the next message was the Rektor's uncompromising Ultimatum email that started our Tiny Little War. That's the end of the clearly documents errors by Deputy Rektor Alistair Robertson. I suspect many others but cannot document them. Based on the errors documented above, how well do you think Dr. Robertson has been handling the student disciplinary cases that come into his care?